I love Vue. It's a great framework allowing you to build awesome web applications. But the real magic is you're not limited to web only. You can simply make native mobile applications using Weex or NativeScript-Vue; but also there is a way to build desktop apps. You can choose Electron or Vuido library for this purpose. In this article I will describe Vuido approach an in the next one I will try to build the same app with Electron. 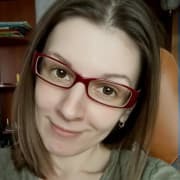 Vuido is a framework for creating native desktop applications based on Vue.js created by Michał Męciński. Applications using Vuido can run on Windows, OS X and Linux, using native GUI components, and don't require Electron. Under the hood, Vuido uses the libui library which provides native GUI components for each desktop platform, and the libui-node bindings for Node.js. 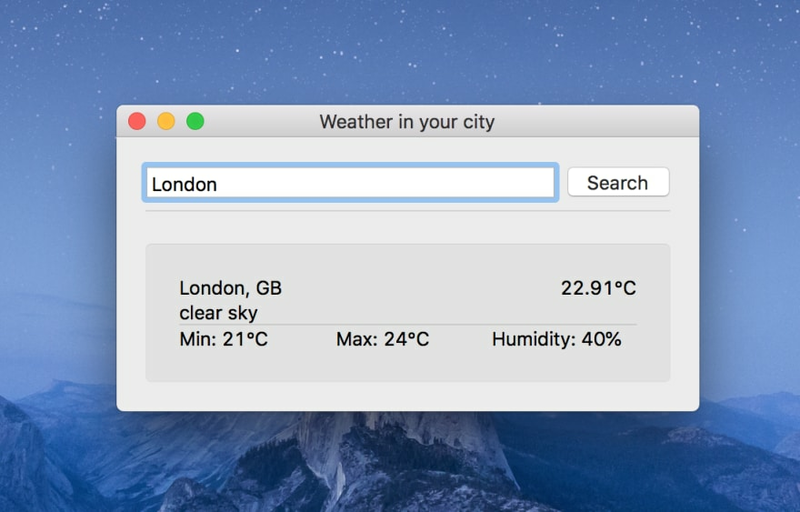 As an example, we will make a simple application checking current weather in the city of your choice. We will use OpenWeatherMap API to fetch actual data. If you want just to check the final code, it's here. I was using OSX for development and I've had Xcode installed at this moment. Also, you will need vue-cli installed (if you're using Vue CLI 3, you will also need @vue/cli-init). The first thing you need to know about Vuido is it's using native components. So there are neither our familiar HTML tags nor CSS styling - only a set of native GUI components compatible with different desktop platforms. An ppplication built with Vuido will have the native look and feel on each platform. This may be considered as both advantage and disadvantage - you can't build an application with a very custom appearance but it will be more lightweight and will work faster than the one built with Electron. The full list of built-in components could be found in this section of Vuido docs. To align an input field with a button horizontally and add a padding between them, we need a <Box> container with horizontal and padded attributes. Box is similar to HTML div, it works as a wrapper to contain and align components. TextInput is an input field, it's stretchy attribute means it will stretch to fill available space. Now the idea is to fetch current weather conditions with a given query string as a city. To get weather data I used the OpenWeatherMap API. It provides a lot of different stuff but we need only Current weather data chapter. You can check an example of JSON response here. As you can see, the first box is the input container we've created in the previous chapter. Below there is a Separator - a horizontal line to visually separate widgets. Next is Group - it's a container which provides a border with a caption around its content. In my opinion, the best and the easiest way to package Vuido-powered application is the one recommended by the library author. He recommends using his own libraries LaunchUI and LaunchUI Packager to package and distribute applications to end users. 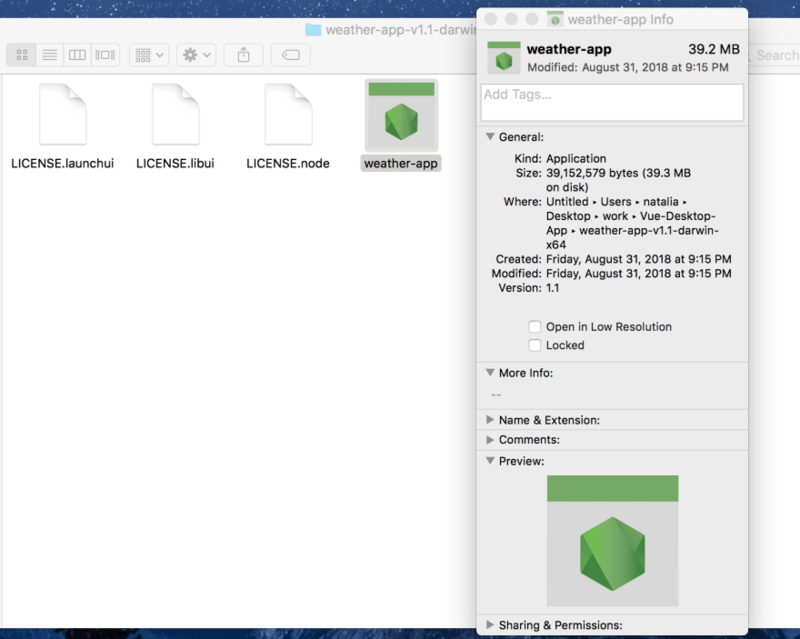 In the command above weather-app is the application name, 1.0 is a version and dist/main.min.js is a path to bundle file. After this a folder with my application! Package size is 39Mb which is a bit more than promised by author (~20Mb mentioned in docs) but not so much anyway. If you try to run it you might notice it's starting really fast (0.1s or so). Vuido looks like a good option if you need a fast small application with a basic appearance. It has a clear documentation and probably the list of built-it components will grow in the future. Thank you for this article. If possible, I would like to translate this article and share it with Korean developers, can I translate it? Sure, would be happy to see it translated! Many korean developers like this article! But that's the problem with Vue libraries -- the ecosystem is still frustratingly immature. I had a really hard time with Weex and NativeScript-Vue; so many hoops to jump through and so many errors that I gave it all up and decided to make apps in Java and Android Studio (me is Android-only guy). libui, now that I checked it, is also not maintained actively, and its future looks uncertain. The framework itself has matured, I'd say, and can give React a run for its money. But for anybody wanting to use these other tools for serious work, please, please avoid them. Trying to write a GUI in PHP or a game in Elixir sounds fun, but is really not for the long-term. libui, now that I checked it, is also not maintained actively, and its future looks uncertain. I don't have any plans on using Vuido and libui, but the latter just had a release on September 1st, 2 in August, several in May, isn't that active enough for you? It has come to my attention that I have not been particularly clear about how usable or feature-complete libui is, and that this has fooled many people into expecting more from libui right this moment than I have explicitly promised to make available. I apologize for not doing this sooner. Also, sorry but "active enough" isn't what I'm looking for from a library. It needs to be mature and decently popular. Well, one is free to explore to any extent; it's just that they should know the possible future pain. To be honest, I don't understand how my comment had anything to do with you. 😂 I commented on the original post, and you jumped in on my comment (not that you're not welcome! 😛). Nice writeup! I think your executable is probably bigger because of the Axios library also being included. Hi Michal! First of all I want to thank you for your work on Vuido and LaunchUI! Awesome projects and awesome documentation! This is a really good article, with one thing off: Electron apps are not desktop apps. Please stop suggesting that. Electron is a huge resource hog. Running three of them easily eats up all my 8GB of memory. It’s not a solution, but a problem. 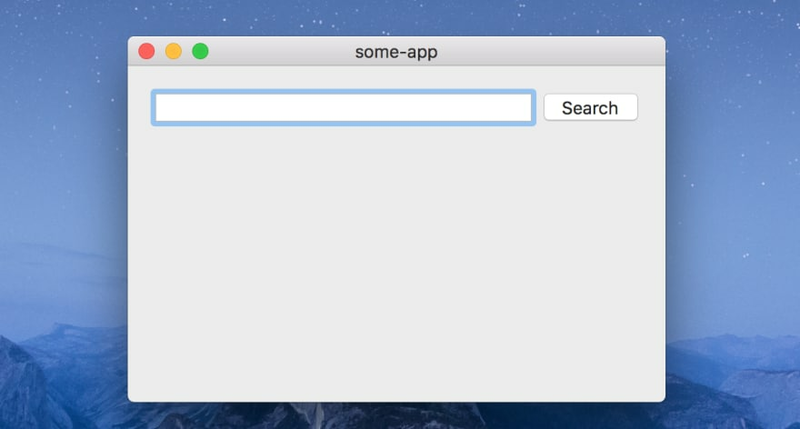 If you want desktop apps, write desktop apps. Alternatively, you can use NW.js. It's all the same features as Electron, but uses much less resources. If lower resources are your highest priority though, then go with LibUI-Node/Vuido. It will be! too many big tech companies use it worldwide! You've left out NW.js, which has great Vue support. There is nw-vue-devtools, which unlike Electron is always the latest most up-to-date version of Vue's dev tools. There is Vue-Desktop-Basic, NWjs-Vue, NW-Skeleton, and Vue-NW-Seed for boilerplates. NO ONE should be using Electron. With that sad, glad to see Vuido/LibUI-Node getting some attention. I was just wondering if it was possible to use Vue with Electron so I'm looking forward to the next article! Great introduction, I saw Vuido some time ago and it's such an intersting project. Really interesting article! Now I'm wondering what I want to build with Vuido! I wonder if it supports menubar apps on mac/win. Anybody? Natalia this is brilliant! thank you so much! - looking forward to the electron version!! It's nice but without an ability to customize interface it's not so good as it could be. I've made the exact same thing using, Native-Script vue (on IOS and Android) ! Seems like OpenWeatherMap is a good start for a first app. What tools do you use to self-manage your projects? 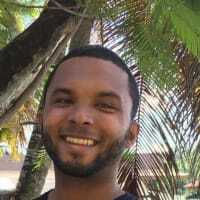 Aside your companies tools such as Jira, Pivotal, and similar, what other tool you sugget as a freelance developer to take care of a project tasks/backlog?